The Academy distributes five external publications intended to keep students, alumni, faculty, staff, partners and friends up-to-date with the good work the institution does around the world. The Academy is a semiannual, color newsletter featuring news and events pertaining to the institution, its programs, and its constituents. The Academy features articles highlighting the work done in the institution’s various departments, shines a spotlight on featured alumni, and recognizes the Academy’s Awards of Sport program honorees. The Sport Journal is an online peer-reviewed journal of sport dedicated to providing content that addresses key issues in sport, maintains appropriate standards for academic rigor and meets needs of the sport profession. The Sport Digest is the Academy’s daily blog dedicated to covering contemporary issues in sport, featuring articles written by Academy faculty and staff as well as newsworthy stories from around the world. 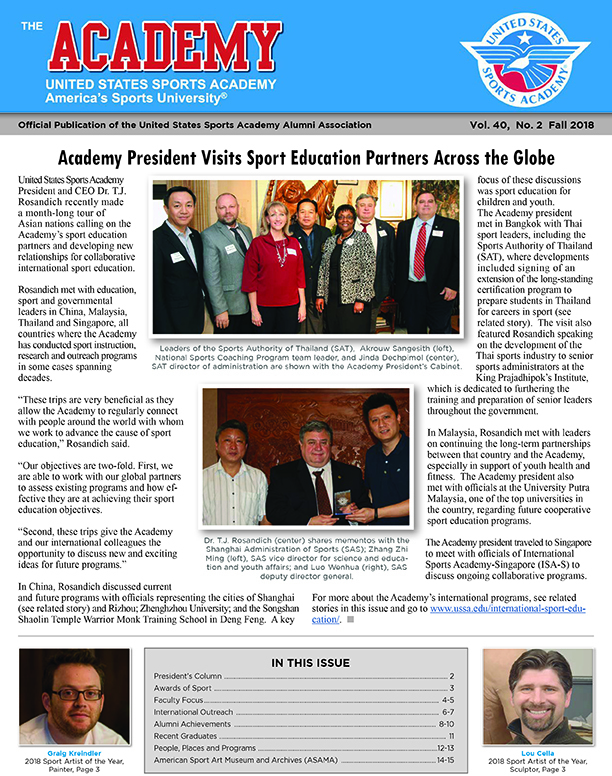 The institution’s two main emailed publications are The Sport Update and The Alumni Network. The Sport Update highlights the work of the Academy faculty and family, the institution’s international programs and Awards of Sport honorees, and features stories about the art and artists in the American Sport Art Museum & Archives. The Alumni Network shines a spotlight on Academy alumni who are using their degrees to make the world a better place and highlights monthly graduates, honor students, and more. Want to receive our email publications?